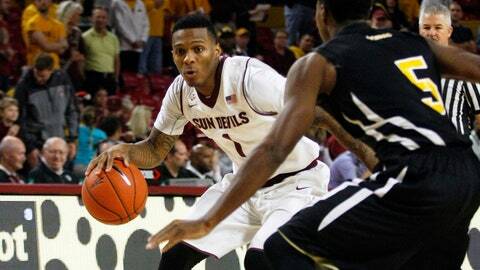 Point guard Jahii Carson leads ASU with 19.3 points per game as the Sun Devils begin Pac-12 play Thursday against Washington. TEMPE, Ariz. — Arizona State won 11 games against a meatier nonconference schedule this season, an achievement that should sit well on selection Sunday. Now comes the more speculative part. How well did games against Marquette, UNLV, Creighton and UC Irvine prepare the Sun Devils for what appears to be a rougher, tougher Pac-12 conference season? Despite strong early showings by point guard supreme Jahii Carson, post threat Jordan Bachynski and newcomers Jermaine Marshall and Shaquielle McKissic, ASU takes nothing for granted. "I definitely think we have work to do," said Bachynski, who was leading Division I in blocked shots through the third week of December. "I think it is always fluid," ASU coach Herb Sendek said. "I think it is always changing, and I think right now we remain on edge and have a great need to continue to get better, given the competition we are going to face night in and night out. You just show up each day and keep battling and keep grinding." Carson, the 5-foot-11 point who already said this will be his final college season, has again led the way, as he did last year while becoming the Pac-12’s co-freshman of the year. He is averaging 19.3 points a game and 5.4 assists. He has always been able to get the ball to the basket, but he has shown a noticeable improvement in his outside shooting. Carson has made 19-of-37 3-point field goal attempts, 51.4 percent, and 49.3 percent of his field goal attempts. He made 33 3-pointers all last season. The more physical nature of games against NCAA staples Marquette and Creighton, Mountain West challenger UNLV and Big West favorite UC Irvine, for example, should help as the Sun Devils prepare for a league schedule that includes two teams in the top 12 — No. 1 Arizona and No. 12 Oregon — and two others who have been ranked at times, current No. 21 Colorado and UCLA. "This time for sure guys are going to be used to banging up against the best guys," Carson said. "We will not be blind-sided when we see good players. I know guys are going to step up. We’re going to see how they compete. It’s going to be tough. I know I’m going to bring it." ASU (11-2) will open conference play against the Washington schools this week, playing host to Washington on Thursday and Washington State on Sunday. While Carson blew threw Washington to score 32 points in the first meeting last season, the Huskies, as much as anyone, could be blamed for keeping the Sun Devils out of the NCAA tournament last season. Washington won both games, including one in late February in Tempe, by dominating the backboards. ASU has played its first 13 opponents almost exactly even on the boards. Bachynski is averaging 12.4 points and 9.8 rebounds, two rebounds short of averaging a double-double, but others have to help keep opponents off the offensive board. With Bachynski and his 63 blocked shots clogging the middle, the Sun Devils have limited opponents to 38.6 percent shooting from the floor. Then-No. 20 Creighton, probably the best team ASU has played, shot 53 percent in its victory in the Wooden Legacy on Nov. 28. "I definitely think we’re miles away with were we need to be on defense," said athletic senior forward McKissic, who has received a crash course in Division I defense after transferring from a Seattle-area junior college for his only season of eligibility. I think we are very confident. We beat some good teams, that built our confidence. "That’s everybody except for J.B. (Bachynski). I feel without him we would be in a world of trouble. I feel like we all try to stay on our man, and J.B. is kind of the emergency exit. When it gets down to it, he (our men) got past us and hopefully J.B. can swat it. We have to make it a top priority." Small forward McKissic has come into his own in the last four games, with 56 points, 21 rebounds and nine assists since being held out of the final game of the Wooden Legacy, a loss to Miami on No. 30 when Carson played through right ankle soreness. He had his first double-double (14 points, 12 assists) against DePaul and followed that with 19 points against Grambling and 18 against UC Irvine. He has 27 assists and two turnovers. Off guard Jermaine Marshall, a transfer from Penn State in his final season of eligibility has been consistent wing threat who can also drive the ball to the basket. He is second on the team in scoring at 15.5 points a game and is shooting 50 percent from the field and 46 percent on 3-pointers. Jon Gilling has made 46 percent of his 3s in a more secondary role this season with the addition of Marshall and McKissic while averaging 3.5 assists and 3.9 rebounds. Freshman small forward Egor Koulechov started several games and has provided a spark as a reserve. "I think we are very confident. We beat some good teams, that built our confidence. You see guys like Shaq catching stride, that builds your confidence," said Marshall, who has made the transition to a more fast-paced game than in the Big 10. "The Big 10 is slow it down, grind it out and play defense. Here, we try to run a lot more. I just try to adjust, fit in and do what is best for the team. I think it definitely suits me. It took awhile for me to do that. I think I am starting to be where I want to be." The Pac-12 schedule is not a true round robin. ASU will not play the Washington schools on the road or UCLA and USC at home. "The Pac-12 is going to be tough this year. The Pac definitely has stepped its game up," Bachynski said. "What Coach Herb (Sendek) has done is put us against the best teams. We’ve played some really solid teams and had some great wins. Hopefully it’s prepared us. Only time will tell, but I feel more prepared that in past years. We’ve made strides, but we have to keep chopping wood every day."